Sgt. Thomas Grant is buried in Arlington National Cemetery. In the great history of our United States of America, the word patriot represented all spectrum of life, no matter in what position one serves. In general, we all connect this word with the Revolutionary War that brought about the birth of our nation. Such patriots as George Washington, Thomas Jefferson, Benjamin Franklin, Alexander Hamilton, Thomas Paine, Francis Marion, Thomas Sumter, Crispus Attucks, Peter Salem, Molly Pitcher and Abigail Adams all have been etched into the foundation of American history. Crispus Attucks is considered the first American killed in the Revolutionary War. On March 5, 1770, the British soldiers were in Boston and the colonists began to throw snowballs and debris at them. A soldier was struck with a piece of wood that was said to have been thrown by Attucks. The soldier retaliated with a volley of deadly shots with Attucks being the first fatal out of the colonists. Thus, Crispus Attucks became the first colonist casualty in the war that gave birth to America. With the loss of his life, Attucks surely fits the description of the word patriot. In our great history, Orangeburg has produced its own patriots. Some of these men and women are lesser known than others for their contributions to our state and nation. Such names as 1st Lt. William A. Salley of Springfield, Cpl. Rudolph Hoover Jr. of Neeses, Albert Dixon and George Watson, both of Orangeburg, and many others from this area exemplified their patriotism through their service to our nation. Recently, I conducted some research on what I would consider a sacrificial patriot. The following article will follow the life of a man who displayed a much wider description of that word. Thomas Grant, the son of Mr. and Mrs. Willie Grant, was born in Orangeburg on September 21, 1930. He attended Wilkinson High School and was said to have been an outstanding football player. After Wilkinson High, Grant joined the U.S. Army and was trained at Ft. Jackson in Columbia. At that time, the Korean War had started on June 25, 1950. Grant and other men from Orangeburg were deployed to support the South Koreans. On Sept. 9, 1950, The T&D reported: “2 Area Men Listed as ‘Missing’ — An Orangeburg soldier and another from Swansea were among Army casualties announced by the Defense Department in Washington at 6 p. m. today. As the news of Grant and Mack circulated in Orangeburg, the families of these soldiers were on pins and needles while they waited for information from the Department of Defense. They constantly prayed for the safe return of the two soldiers. On Jan. 16, 1951, The T&D reported: “2 Local Soldiers Reported Wounded in Korean War — The names of two Orangeburg men appeared on casualty lists made public yesterday and today by the Department of Defense. The news of the soldiers’ condition was slow in receiving as the weeks and months passed. As time went by, the more anxious the families became. The receipt of no news from the Department of Defense became exceedingly stressful. Day in and day out, the wait began to take a greater toll. On Dec. 20, 1951, The T&D reported: “3 Men from County On Prisoner List -- Orangeburg County was cheered yesterday by indications that at least three of her five servicemen missing in Korea are safe in Communist prison camps. “Names of three from Orangeburg County had already been listed by the Department of Defense. However, the complete list handed over by Communist truce negotiators in Korea had not been released, pending checking of next-of-kin. “The Defense Department emphasized that it could not vouch for the accuracy of the information since it was supplied by enemy sources. On Jan. 4, 1952, The T&D reported: “POW in Korea Writes Mother of Big Christmas -- Christmas for a former Wilkinson High football player who is now a prisoner of the North Koreans probably was a little more enjoyable than the average POW’s holiday, according to a letter received here by his mother. “Cpl. Thomas A Grant, son of Mrs. Eartha M. Grant of Mingo Street in New Brooklyn, wrote on Christmas Eve from a North Korean prison camp and foretold of a ‘big Christmas dinner of fried chicken, apple pie and many other things’ followed by church services and a football game in which he would play on Christmas Day. “Grant, a Wilkinson High football player in 1949, gave his address as POW Camp, North Korea, %Chinese Peace Committee for World Peace, Peking, China. On Aug. 8, 1953, The State newspaper reported: “Latest List of Freed POW’s — The United Nations Command official master list of American prisoners of war freed today in the Korean armistice POW exchange: Thomas Grant, Cpl., Co. K 9th Rgt. 2nd Div: mother, Mrs. Eartha Mae Grant, Rt. 1 Box 36 Orangeburg, S. C.
When Grant returned to the States, he was sent to Ft. Jackson and then placed on leave. According to his sister Miss Juanita Grant, “My mother and brother ‘Junior’ (Willie Grant, Jr.) went to Ft. Jackson to pick them up. My father could not get off from work to go along with my mother and brother. Everybody was so glad to see Tommy when he arrived back home. The Grant family consisted of two girls and three boys. They were Tommy, Willie Jr., John, Juanita and Helen. John followed his brother in the military and served for 21 years. Shortly after his retirement, he became the first African American to hold the position of investigator for the Orangeburg County Solicitor’s Office. He retired from that position after 22 years. The experience that American prisoners encountered during the Korean War were recounted in a book by William H. Funchess, who was in the same camp as Tommy Grant. On Nov. 30, 1997, The T&D published an article written by the late Dean Livingston. “Somber words of misery run through account of Korean POW horror — In the early 1950’s, more than 33,000 Americans died in a war that has many names. Some call it the 'Korean War,' others the 'forgotten war' or the 'unknown war.' It was a war without a victor. "About three years after it started it ended in a 'negotiated settlement' between United Nation forces, of which the United States dominated, and the Communists of North Korea and Red China. "During the bloody conflict, 10, 218 American soldiers and airmen were captured by the Communist forces. At war’s end only 3,597 of those imprisoned Americans were alive to be repatriated. "Funchess’ 'Korean P.O. W.-A Thousand Days in Torment,' will not make it into the movies or on television. The harsh, unvarnished details of the cruel and barbaric treatment he endured as a prisoner of the Chinese Communists are not what one would want to read for entertainment. "The author tells of death by starvation, death by freezing in weather that often was as cold as 30 degrees below zero, death by lack of medical attention, death by having the blood sucked out of your body by lice, and the most feared of all, death by the firearms of your captors. During the time that Tommy was a prisoner, he met a friend for life in the name of Albert Dixon in Camp Pyok-Dong. Dixon was from Manchester, Georgia. And that, Albert Dixon did. He moved to Orangeburg and became an outstanding citizen in our community. Dixon worked as a security guard and bus driver for Orangeburg School District Five for many years. Whatever Tommy Grant told Albert Dixon about our Orangeburg community, it must have been mighty convincing because Dixon fell in love with Orangeburg and he continued to lived here until his death. Dixon died on Aug. 14, 2012. The meeting of Grant and Dixon under that traumatic condition brought about a bonding of these gallant soldiers that lasted until the death of Tommy fighting a battle in Vietnam. The Korean War that Grant and Dixon fought in and during which they became prisoners of war was considered a stalemate because the North and South Koreans were still divided at its ending. The two countries still continue to be divided to this day. Until recently, no North Korean citizens was allowed in the South and vice versa. After coming home and recouping from that traumatic experience, Grant continued his military career. In 1955, he married Junell Glover, who lived in Orangeburg. In a recent interview with Miss Junell, who lives in Plainesville, N.J., she said that during Grant’s career, “he enlisted in the Army in 1947 after attending Wilkinson High School. In September 1950, he was reported as missing in action by the Department of Defense and was not released until August 1953. 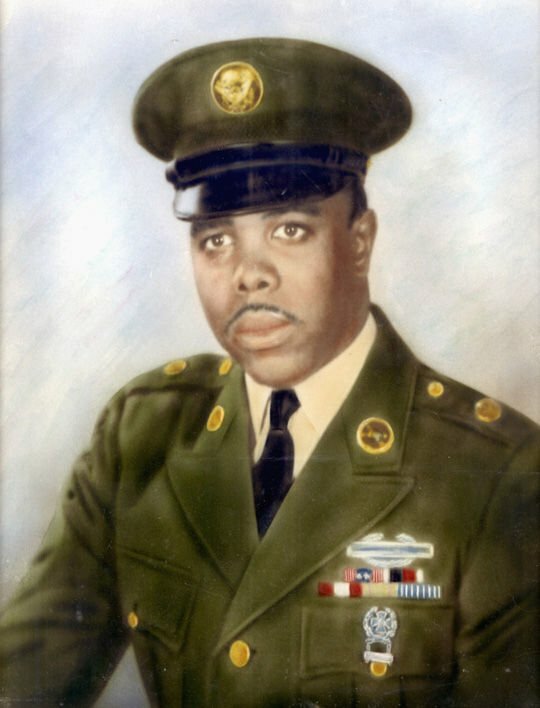 When he returned to Orangeburg, his mother and the family thought that he would not continue his career as a soldier after his experience being a prisoner of war. After a period of reuniting with his family, he was stationed at Ft. Jackson in Columbia. In 1955, she said, “we got married. During the Berlin Crisis in the early 1960s, he was sent to Germany for two years but the Army would not allow me and my children to move with him. Junell said, “In 1967, Tommy was again given orders to go to Vietnam. This time, he tried to contact military personnel in the Pentagon about his situation of retiring after 20 years of service. His request was denied and on July 1, 1967, he was deployed with his company to Vietnam. "Just before leaving, Tommy went out and bought a brand new 1967 Pontiac Bonneville.” She noted that “all of the children used that car to get their license. On Dec. 18, 1967, The T&D reported: “Sergeant Grant, Local Veteran, killed -- Sgt. Thomas Grant, son of Mr. and Mrs. Willie Grant of Orangeburg, died Dec. 8 in Vietnam as a result of combat wounds. "He was born and reared in Orangeburg and was a career soldier. During the Korean Conflict, Sgt. Grant was held as a prisoner of war for some time by the enemy. "Sunday would have been the date of his retirement from the U. S. Army, being the end of his 20 years of service. "Surviving in addition to his parents are the widow, Mrs. Junell Glover Grant; two daughters; a son; two brothers; and two sisters. Platoon Sgt. Thomas Grant began his tour of duty in Vietnam on July 1, 1967. When the troops engaged a unit of Vietnam soldiers in a fire fight, Sgt. Grant was critically wounded by fragmentation from the tossing of a grenade that resulted in multiple wounds causing almost instant death. Sgt. Grant’s death was from hostile forces in the Province of Binh Dinh in the Battle at Tam Quans. Fourteen Americans were killed and a number them received multiple wounds. The wounded and dead had to be taken out of the fields one by one because the troops could not cut a LZ (Landing Zone) for the medic helicopter. After locating this powerful post by Jannusch, I began to wonder why he posted this message 50 year later. According the Vietnam veteran George Watson, the VFW of America celebrated the 50th anniversary of the Vietnam War in 2017. Each veteran received a pin to commemorate that period of war in America’s history. Sgt. Thomas Grant was a true patriot that indeed served his country with great valor and honor that will always be remembered. May you continue to rest in peace. Richard Reid is president of the Orangeburg Historical and Genealogical Society. His mission is researching Orangeburg history, with a particular emphasis on the role of African-Americans in that history.